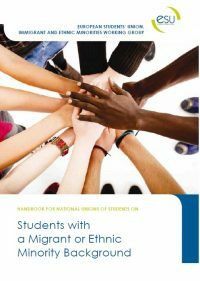 This handbook has been written by the European Students’ Union’s Ethnic Minorities Working Group (EMWG) based on the work it conducted from its establishment at ESU’s Board Meeting 57 in 2009 until its expiration at the Board Meeting 64 in 2013. The work was undertaken by representatives from ESU’s members SAMOK (Finland), NUSUK (UK), LSVb (the Netherlands), ANOSR (Romania), NASC (Bulgaria), FAGE (France) and NSUM (Macedonia), as well as ESU’s Equality Coordinator and Human Rights and Solidarity Coordinator and previous members of social affairs committee. The demographically convenient labels of persons of a migrant or ethnic minority background cannot be treated as one group, and any single policy initiative aimed at improving performance or attainment of education targeted at such a broad group tends to have a simple and predictable effect – those who are doing well in society will improve their lot, but those who are marginalised will continue to be so, in extreme cases their performance may actually disimprove. Ethnic minorities are vast and complex groups of people. Some identifiable groups, such as the largest in Europe – the Roma people, live in no single geographic region and live in every country in Europe and beyond. Other groups, such as the Basque community have maintained coherence because of their geographic location. Migrants, whether from within the European Union, whether migrants of economic necessity, personal choice, or so-called third-country migrants resident in Europe for reasons of asylum, economic necessity or choice all have as many different contextual backgrounds as there are people. As such, it is intensely challenging to attempt to create any single policy or set of guidelines to deal with a non-unified group of demographic convenience, rather than a single community. As the numbers of people within Europe who might fall into the category here discussed runs to the dozens of millions, the statistical data which reinforces the underperformance and underrepresentation of these groups in higher education is an unacceptable aberration and it is the responsibility of all parties involved in higher education governance to take actions to improve the chances of any group which is victim to inequality. It is the firm belief of the authors of this toolkit that National Unions of Students are not exempt from this obligation. To download the publication, click on the image below.